Ballerina Roses are beautiful little gems that fill their sprawling bushes in a light pink haze. 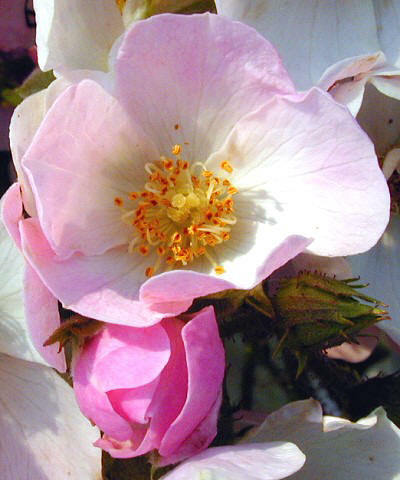 If you want an antique look in your garden, this hybrid mush rose (originally introduced in 1937) is the rose for you. It sprawls or climbs or can be cut back into a shrub like form and used as a hedge. It has a devil may care look to it that makes it looks like it has always been in your garden. We love the way Ballerina climbs in amongst other vines, like our Fo Ti and finds its way up into our Hever Castle Butterfly Bush. 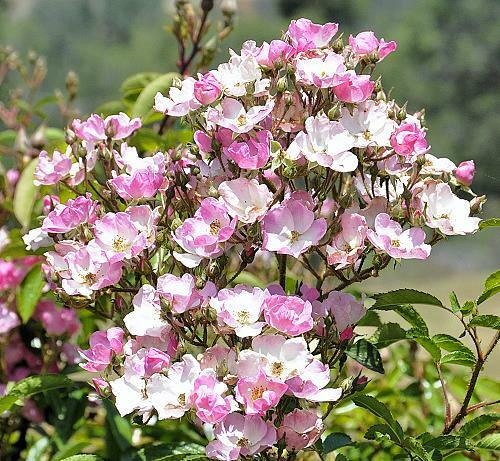 Like all roses, Ballerina Roses are sun loving and fairly drought resistant. Plant in well drained soil and fertilize with an organic fertilizer in the spring. We prune out dead canes whenever we notice them and shape the plant to the height and width we want in fall. All rose petals are edible if grown organically and make attractive garnishes for salads. They can be added after cooking to almost any dish. Whole buds can be used to decorate cakes or other confections. Sample buds should be pulled apart and inspected for insects before using on food.